Kedzuf said that every little bit – or in this case, every light – can help contribute to the survival of these threatened and endangered animals. Better lighting will make the beaches more conducive to nesting females, and ensure that more hatchlings crawl towards the ocean upon emerging from their nests. She said that we all need to work together to make our lights turtle-friendly, which could help Broward County see more record-breaking years in the future. 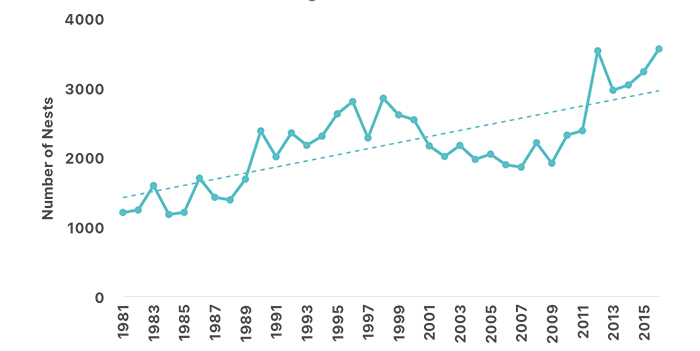 Burkholder said that female turtles return to the beach where they hatched, and that when more hatchlings make it to the ocean, statistically there is a greater chance of more turtles returning to lay eggs of their own. 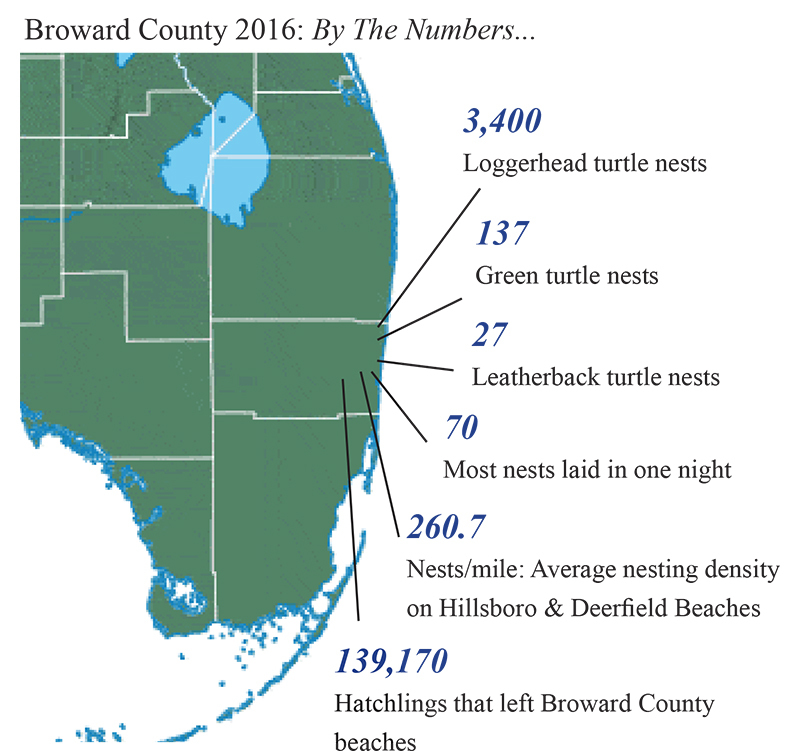 In Broward, three species of sea turtles – loggerhead, green and leatherback – lay their nests on the nearly 26 miles of beach. 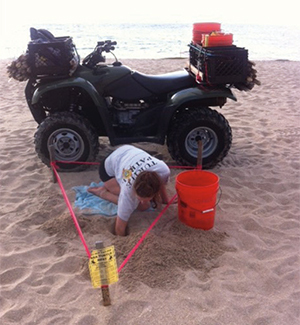 During nesting season, an army of volunteers, marine scientists and NSU students hit the beaches in Broward County looking for evidence of new nests. When they find one, they work to “rope off” the area with wooden stakes and brightly colored ribbon. The team records various information, including the location and date the new nest was laid, and then it’s pretty much a waiting game until the hatchlings emerge and head to the open sea. A leading mission of NSU and the BCSTCP is community outreach and education. Some of the educational programming is centered on public sea turtle hatchling releases. In partnership with Anne Kolb Nature Center for the “Sea Turtles and Their Babies” program, an informative “turtle talk” gives participants background information about sea turtles worldwide and especially focuses on the many species found in Florida waters. 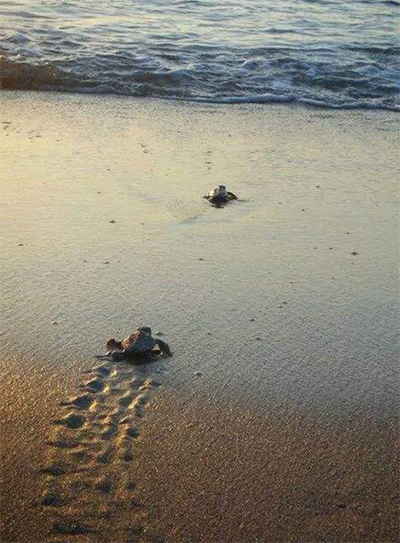 This program then allows participants to accompany permitted individuals to the beach where sea turtle hatchlings are released; visitors get to witness the beginning of the hatchlings’ long journey out to sea first hand. The generous support of the National Save The Sea Turtle Foundation, through their Adopt-A-Nest Program has allowed the BCSTCP to greatly expand education, outreach, research and conservation efforts again in the 2016 season. The program’s sea turtle experts conducted 142 education/outreach events in 2016, connecting with over 50,000 individuals! The BCSTCP team also organized sea turtle seminars and participated in a number of larger table events to reach a wider audience.